This Situation Update describes events occurring in Nyaunglebin District between February 2013 and April 2013, including movement restrictions, forced labour, arbitrary demands, landmines and environmental destruction from gold mining. 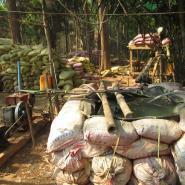 58 villagers and their carts were used to transport rations for the Tatmadaw Light Infantry Battalion (LIB) #590 and Infantry Battalion (IB) #30 in Mone Township in February 2013. 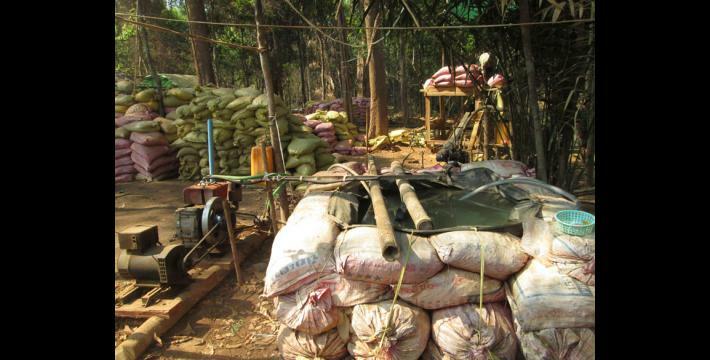 Tatmadaw LIB #264 Battalion Commander Kyaw Min Oo demanded 350,000 kyat (US $359) per month in arbitrary taxes from gold miners in Kyauk Kyi and Shwegyin townships and confiscated logs from three villagers amounting to a total of 4.5 million kyat (US $4,620) without any payment. A villager was detained on March 25th 2013 and released on March 26th near Hsaw Mee Loo army camp by Tatmadaw Strategic Operations Commander Aung Kyaw Kay. Different and conflicting policies issued by the Karen National Union (KNU) and the Burma government relating to lake use and management have restricted fishing and led to court sentences for some villagers in Kyauk Kyi Township. Between January and April 2013, four villagers were injured by landmines in four separate incidents all in Mone Township while the villagers were out looking for firewood or vegetables. 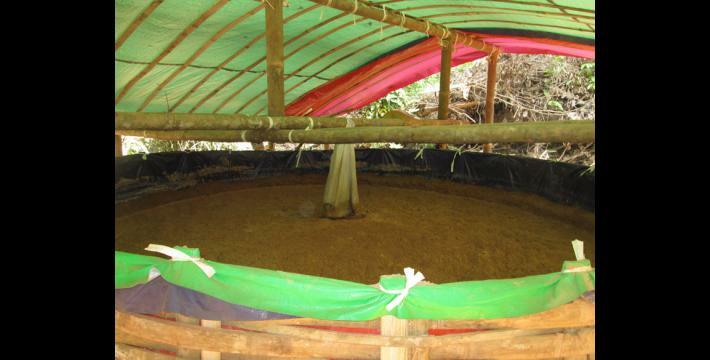 The use of chemicals for gold mining has led to the contamination of drinking water in Kyauk Kyi and Shwegyin townships. The following situation update was written by a community member in Nyaunglebin District who has been trained by KHRG to monitor human rights conditions. It is presented below translated exactly as originally written, save for minor edits for clarity and security. This report was received along with other information from Nyaunglebin District, including 416 photographs and four video clips. In our region, human rights abuses are always occurring. They are (1) forced labour; (2) demanding money; (3) causing troubles [to villagers] by [arbitrarily] detaining them; (4) water [lake] problems where the rich people confiscate the residents’ properties; and (5) finally, the ongoing activities of the Burma military [Tatmadaw]. There are many kinds of human rights abuses but the villagers’ faces are turned [tricked] and the abuses are committed in a sneaky way. Moreover, the Government speaks out to do development projects and much of the land they have invaded is being used for [development projects] and is being destroyed. The villagers from the region are only labourers. The country’s leaders substitute politics with economics. On February 11th 2013, LIB [Light Infantry Battalion] #590 and IB [Infantry Battalion] #30, which are based in Htee Ler Baw Hta camp, demanded 18 carts from D--- village and 40 carts from F--- village, so that there were 58 carts in total. They [F--- and D--- villagers] have to go and transport things from Theh Hpyu Chaung. They asked the villagers to go and take the rations with the carts because their rations were only sent to Theh Hpyu Chaung. The villagers were not given any wages for transporting [rations]. On the same day, Battalion Deputy Commander Aung Naing Htway from LIB #590 demanded 23 carts from K--- village to send rations to Ma La Daw military camp. The LIB #264 demanded money from the gold miners in Ler Doh [Kyauk Kyi] Township region and Hsaw Htee [Shwegyin] Township. 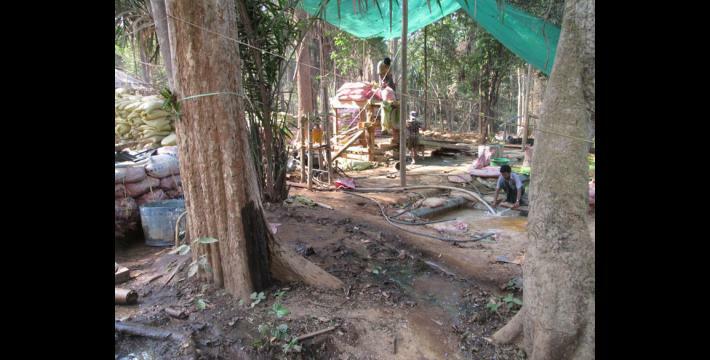 They [LIB #264] demanded 350,000 kyat (US $359)  from [the owner of] each gold mining machine every month. Battalion Commander Kyaw Myo Oo from LIB #264 asked his people to collect money for two months from the gold mining machines. On February 5th 2013, the LIB #349 replaced LIB #264. There are 50 gold mining machines, and because a new battalion arrived and demanded money from them again, it causes difficulty for them [the villagers]. Demanding money from the gold mining machines is not the taxation policy that the Government has set up, but is only an illegal way of collecting tax. Battalion Commander Kyaw Min Oo from LIB #264, which is based in Baw K’Hta, military camp demanded logs from the logging machine [owners] and said that he would pay for the logs, but after his battalion was rotated he did not provide the payment. LIB #264 Battalion Commander Kyaw Min Oo took logs from people’s logging machines and [the cost of the logs are]: (1) 2,000,000 kyat (US $2,053) from Saw E---’s logging machine; (2) 1,500,000 kyat (US $1,540) from L---; and (3) 1,000,000 kyat (US $1,027) from M---. When the Battalion Commander took the logs, he told the owners that he would give them money for the cost, but still has yet to give any. The LIB #264 took the logs starting in November 2012. On March 25th 2013, SOC [Strategic Operations Command] #8 Commander Aung Kyaw Kay detained and gave trouble to [questioned] a villager in Hsaw Mee Loo military camp when the B--- villager who went and lived in Taw Oo [Toungoo] Town was coming back to visit his siblings and his villagers. When he came back, the Government military [Tatmadaw] arrested him and gave him trouble before releasing him on March 26th 2013. If we look at this situation, even though there is a ceasefire agreement, the villagers cannot travel freely. 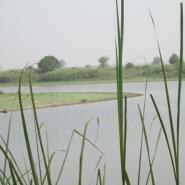 In the village tracts [of Nyaunglebin District], there are many lakes. Regarding the lakes, in the past, villagers from the village tracts could access the lake by paying a tax for a fishing license for each year. 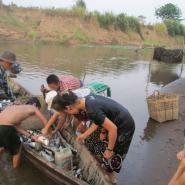 Then, they could get fish paste or frog paste that villagers were not only able to eat but also sell to other places. 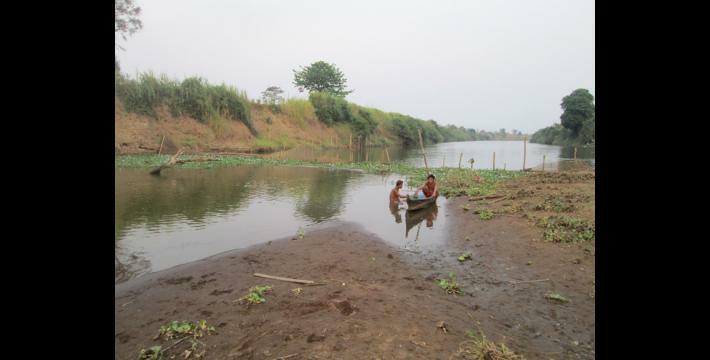 However, in the era of the party council [Union Solidarity and Development Party (USDP)], the villagers could no longer work on the lakes that they previously could access because the licenses for the lake were bought by the rich people from the party council. The Government only taxed the rich people 500,000 kyat (US $513) for a license to access the lake; however, if the villagers want to access the lakes, they have to pay the rich people 3,000,000 kyat (US $3,080) for a license to fish. Therefore, it causes difficulties for the villagers. 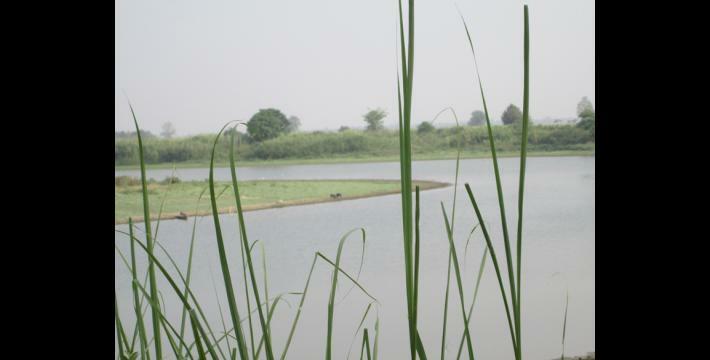 The villagers who had access to the lake no longer have the chance to eat the frogs or fish and cannot work on the lakes anymore. Therefore, in 2012, the KNU [Karen National Union leaders] from Ler Doh Township forbade the lakes from being fenced [by the rich people] and they allowed every villager to earn their living [by fishing in the lakes with a common use system]. The region of that place is in A Nyin Pwa region that is controlled by both the KNU and the Burma government. Two systems for accessing the lake are being followed by the rich people and the villagers; one set up by the KNU and the other by the Burma government. The KNU said villagers can access lakes on a common use system while Burma government issued licenses to rich people who then sold the licenses at exploitative prices to the villagers. When the villagers followed the common use system created by the KNU, the villagers were sent to court [by Burma government officials]. Therefore, it causes difficulties for the villagers. 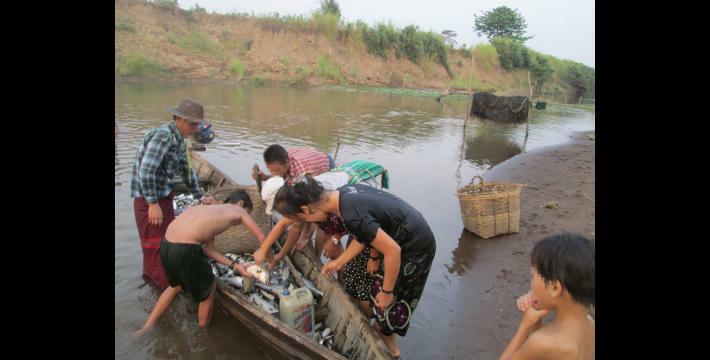 KNU gives permission to fish in the lakes, so the villagers fish there. Villagers from Ler Doh Township region can fish but the Fishery Department and fishery lessees [agents] have created problems, requiring eight H--- villagers from Ler Doh Township to go to court; [these villagers are]: (1) Ko P---, (2) Ko S---, (3) T---, (4) Ko V---, (5) Ko Ht---, (6) Ko Au---, (7) Ko Sh---, and (8) Ko St---. These people have to go to an appointment at court because they fished. The case went all the way to the presidential level and the president gave villagers permission to access the lake by paying the taxes to the local government rather than the rich people at the higher price. 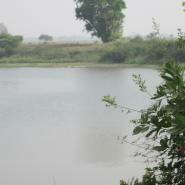 However, the villagers from Shwegyin Township still cannot access the lake for a fair fee. If we look at [the case], it is not concerned with the villagers. It is concerned with the Government and the two groups [the Government and the KNU] that have taken control. They need to be clear with each other. As the two groups are not clear with each other, it causes difficulties for the villagers. 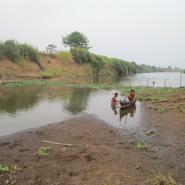 The lake case was a problem for the whole Kler Lwee Htoo [Nyaunglebin] District. The villagers who had access to the lakes could not fish from the lakes anymore because the lakes were only in the wealthy people’s hands. Everything [fishing] is done by the Fishery Department [staff] and the brokers. If we look at when the Fishery Department leased the lakes to contractors for fishing, they not only leased the lakes, which have licenses issued by the government, but they also leased the Bote Pyin Lake and the streams. The streams are where the villagers fished together in the past. Now, the villagers cannot fish anymore because the wealthy people bought them and work on them. Therefore, it causes difficulties for the villagers. The lake issues occur in all of Nyaunglebin District. The groups of Government military [Tatmadaw] based in our region are active and replace themselves in Bgay Hkoh in Moo Township region and in Ler Doh Township region. The Southern Military Headquarters is the active military group and controls two Operations Commands; the Ler Doh Operations Command and Shwegyin Operations Command. The military groups that operate in Ler Doh and Moo [townships] are LIBs #351, #599, and #590; IBs #60 and #5; LIB #307; and IBs #30 and #20. In Shwegyin, LIBs #264, #349 and #589 and IB #57 are active, and for MOC [Military Operations Command] #4, there are 10 battalions: LIBs #701, #702, #703, #704, #705, #706, #707, #708, #709 and #710. They set up their Operations Command in Muh Theh. On February 18th 2013, the MOC #8 replaced the MOC #4. On January 2nd 2013, Saw Eh---, a 22-year-old, whose father’s name is U Gr---, and lives in X--- village, Moo Township went to the forest in order to find firewood. On the way to the forest nothing happened, but on the way back [home], at 9:00 am, he was hit by a landmine at Y--- village. The sole of his foot was split open from being hit by the landmine and he was sent to the Ler Doh Hospital. His leg did not need to be amputated. On April 20th 2013, a villager from Moo Township, Uh---, also referred to as Ko Hs---, who is a 23-year-old whose father’s name is U Th---, was hit by a landmine at 7:00 am while he went and looked for firewood. He was sent to Moo Hospital and his left leg was amputated. He was hit by landmine at [a place] one mile from Kyuang Su, which is in Kyi La Myaung region. Both the KNLA and the Burma militaries are active in that place. On February 13th 2013 at 7:00 am, Dt---, an 18-year-old boy whose father’s name is U Na---, from Lh--- village, Moo Township went to log. He went with a cart and, on the way there, a landmine hit the cart and Dt---’s back. The place where [he was hit by the landmine] was in Kr---. He was sent to the Moo Township Hospital after he was hit by the landmine. On March 2nd 2013, a villager called Kyaw J---, 25-years-old, whose father’s name is U M---, from Meh Meh Su village, Moo Township was hit by a landmine while he went and looked for vegetables. He was hit by a landmine at K--- village and he was hit by the landmine at 5:45 am while he went and looked for vegetables. His right leg was cut off [by the landmine]. Villagers are always hit by landmines in Moo Township, and the Burma military is still active until now. Even though there is a ceasefire agreement, the Burma military has not ceased its activities yet but is still active there. Even the KNLA is active there. Therefore, as the two military groups are active, I do not know whether the landmines are old landmines or new ones. We cannot say whether the landmines are from the Burma military or the KNLA for sure. If we look at [the situation], because of the armed groups’ fighting, the villagers have to suffer in the middle. The places where the landmines exploded are in the Moo Township region. In our region, there are a lot of people who mine gold. The gold miners dig the land and pan with a machine. 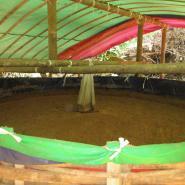 They use chemicals to mine gold and, in the future, it will cause drinking water problems for the region. If the [water which includes the] chemicals is drunk, four lives will be killed. Regarding the gold miners from the region, because the wealthy people cannot mine directly, they use the resident miners from that area; the resident miners do as much work as they can handle. 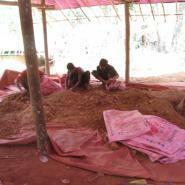 The gold miners [businessmen] are from Yangon. There are only a few residents [local villagers]. The gold mining destroys the land a lot and harms the environment. Moreover, because they use the chemicals, it causes problems for the residents. The water is not pure and there is only poisonous water left. 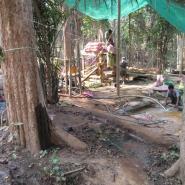 The gold mining takes place in Ler Doh and Hsaw Htee townships regions. Nowadays, the Government does not solve the ethnic conflicts and political problems; instead of doing this they are focusing on business. 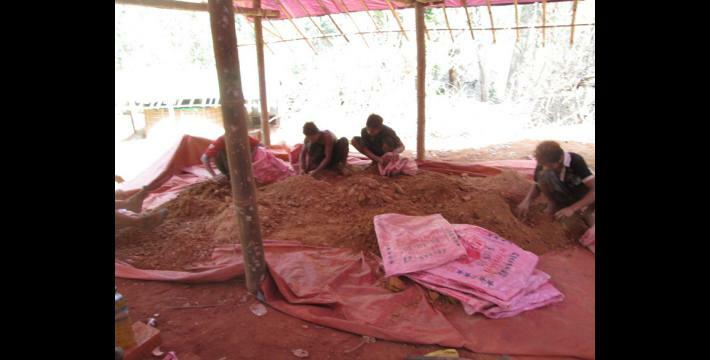 There are over 100 businessmen and they request permission to mine gold. KHRG trains community members in eastern Burma to document individual human rights abuses using a standardised reporting format; conduct interviews with other villagers; and write general updates on the situation in areas with which they are familiar. When writing situation updates, community members are encouraged to summarise recent events, raise issues that they consider to be important and present their opinions or perspective on abuse and other local dynamics in their area. As of November 18th 2013, all conversion estimates for the Kyat in this report are based on the official market rate of 974.180 kyat to the US $1. The KHRG community member who wrote this report spelled the name of the commander as Kyaw Myo Oo and as Kyaw Min Oo, but they refer to the same man. Union Solidarity and Development Party (Pyi Khaing Pyo in Burmese, Pa Ka Hpa in Karen), which was reformed to become the USDA. The community member is likely referring to gold cyanidation. This process involves placing crushed ore into piles where a cyanide solution is poured over it to dissolve the gold and allow it to "leach" out of the pile and also into the ground. This process risks contaminating the surrounding area and is heavily regulated by many nations. The community member means that any animal, fish or person that drinks the contaminated water or eats an animal that drank the contaminated water will be killed. “Four lives” refers to the dangerous chain effect of the poison on the water, environment, local animals and people living in the area.